Why Are Automakers Still Using Race Cars To Sell Street Cars? Back in the 1950's and 60's automakers took their cars to the track with the mantra of "Win on Sunday, sell on Monday." Today, car companies continue to make marketing connections between racing and their production cars, but given the differences in technology and viewership, does it even matter? During the Super Bowl, Nissan aired an ad that hit both racing fans and car enthusiasts right in the feels. 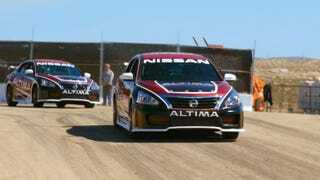 In a brilliant move, the brand revealed both its radical Nissan GT-R LM Nismo race-car and the brand new 2016 Maxima. The message was clear, "If you are a dad and a wannabe race-car driver, you need a Maxima." But I wonder how many Maxima buyers will even care, or for that matter, be aware of the fact that the funky looking Nissan GT-R LM Nismo has a V6 powering the front-wheels, just like their street car. The problem with racing as marketing to sell production cars has to do with a mismatch of the intended audience; the folks that are being targeted either know better or don't care. Unlike NASCAR that has an American audience of about five million viewers per race, sports-car racing draws a much smaller audience. I'm even going to go out on a limb here and say that, for the most part, enthusiasts that watch sports car racing are probably a bit more tuned in to what street cars are actually "performance oriented" or not. They are going to be well aware that a front-wheel drive, V6, large family sedan is not going to give them a "race car" for the street. It is also safe to say that someone who considers themselves a "driving enthusiast" is not going to have the Maxima high on their shopping list, even if it is a "Four Door Sports-Car." Every day I talk with car buyers about their needs and wants when it comes to selecting their next vehicle. Not once, has someone mentioned a specific car because of its connection to racing. For the vast majority of car shoppers the link between their commuter car and a racing car is irrelevant. I'm not saying that racing has no impact on production cars. Dedicated sports cars like the Corvette, the 911 and the Viper have been improved due to the lessons and experiences learned on the track. But the reality is the Corvette and 911 will have still sold well regardless whether or not their respective teams took the checkered flag. As to the Viper, it was one of those cars that looked so right on the race-track, and it raced competitively, but that couldn't help the snake find enough buyers. It's worth noting that Dodge put a lot of effort into the Viper race program in an attempt to sell the car to folks who could appreciate that connection. Then the Hellcat came along with no racing legacy, and people lost their damn minds. You could make the case that Dodge's 707 horsepower muscle car, did more for its brand recognition in the past year than the Viper has done since its refresh. So if racing doesn't really impact sales, why do automakers continue to push ads like this? I think what it comes down to is that that buying a family sedan is a "sensible" purchase. Car buyers, especially males, often equate "sensible" with "boring" and no one wants to be boring. While the truly adventurous would go for a used AMG Mercedes instead of buying a new Fusion, most people just can't make that leap. The automakers know this, they know people want to be practical but not give up on life. So they try to convince us that our family sedan that we purchased due to a recommendation from Consumer Reports, has some race-car DNA, and that makes it okay.